The latest Discworld book, The Shepherd’s Crown, doesn’t just have the task of wrapping up the story of Tiffany Aching, trainee witch. It’s also the very last Discworld book, since author Terry Pratchett sadly passed away earlier this year. The good news is, this is a solid ending to both stories. Some minor spoilers ahead (but nothing too crazy). We once described Tiffany Aching as “the anti-Harry Potter” (and Laurie Penny’s piece about the last Tiffany Aching book is still well worth reading in its entirety.) She’s not the chosen one, and rather than being destined to save the world from ultimate evil, her calling is more to do with trimming the toenails of elderly people and helping with newborn babies. 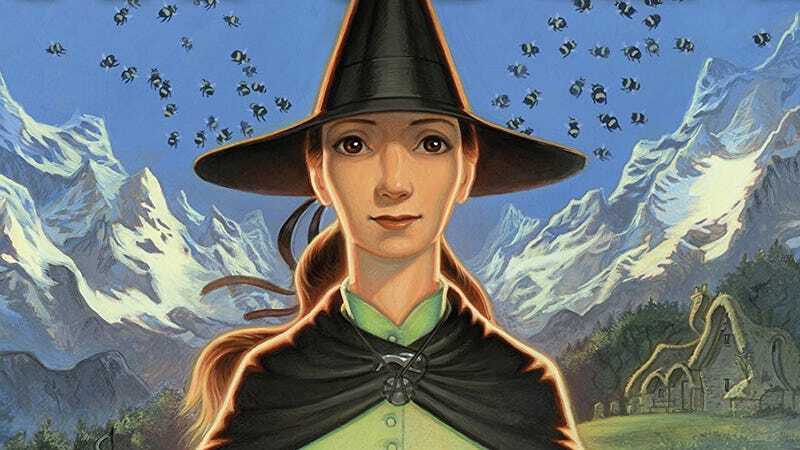 There’s not much glory in the life of a witch, as Pratchett has imagined it, and the main enemies that Tiffany must battle against include pervasive sexism and idiocy. So the coming-of-age, hero’s-progress story for Tiffany is as much a matter of accepting one’s lot in life as it is rising to some kind of fantastic world-beating challenge. That said, The Shepherd’s Crown is surprisingly upbeat, especially as compared to the somewhat darker previous Tiffany Aching book, I Shall Wear Midnight. This is very much the culmination of Tiffany’s journey, and a major theme is that she’s no longer a struggling young girl, but a fully-fledged witch who deserves, and demands, respect. So a lot of Shepherd’s Crown has to do with Tiffany trying to live up to her new status as a proper, important witch, but it’s counterbalanced by a sort of meditation on the nature of death and change. Things are changing, and that includes a very palpable sense of loss, which gives the book a sort of melancholy undertone. In fact, The Shepherd’s Crown is bittersweet for a number of reasons, including the fact that we’ll never get any more Discworld books from Pratchett’s pen. It’s also very much a book about endings, and the kinds of legacies that people leave behind—and what it means to inherit a legacy. The theme of legacies also feeds into Tiffany’s final identity crisis, as she tries to figure out exactly whom, and where, she belongs to. Is her first loyalty to her family and the community she comes from, or to the community of witches that shaped her? The titular Shepherd’s Crown isn’t at all what you’d expect it to be, but represents a legacy handed down to Tiffany from her ancestors, which helps shape this last dilemma. This is a very gentle sort of book, in which there is danger and menace but the most important struggles are small and internal. And as misanthropic as Pratchett’s writing could be on occasion, he seems to come down, this last time, on a fairly rosy view of humanity, affirming our ability to do better and to take care of each other. A major subplot in the book even involves Tiffany trying to give a non-human creature a crash course in human kindness, which she presents as a defining characteristic. And there is a lot of great stuff in here about the power of sheds, too. As a final Discworld book, meanwhile, Shepherd’s Crown presents a beautifully panoramic view of Discworld as a place in flux. Pratchett does a good job of giving cameos to a number of other great Discworld characters, without being too obtrusive, while also giving kind of an overview of how his world is moving into a new era of industrial progress. That said, Shepherd’s Crown is not my favorite among the Pratchett books I’ve read. For one thing, he introduces a brand new supporting character, Geoffrey, who is a bit too flawless a human being to be believed, and who quickly becomes everybody’s new favorite person. For another, the book’s ending is a bit on the anti-climactic side, although it’s still plenty entertaining. All in all, though, this is a beautiful ending to Tiffany Aching’s story, with a blend of sadness and hopefulness that will stick with you long after you’ve closed the pages. As a send-off for Discworld, it makes you just want to go back and re-read the whole thing from the start.